Clip-board – a new twist on a time-tested design Often, less is more, and Lonc Living Products has proven that once again with its new Clip-board series. Lonc, a Dutch design studio, has embraced one of the oldest construction principles around, the humble trestle, and turned it into an ingenious system for tables and benches that relies on the force of gravity – rather than hardware – for structural stability. The tabletop and bench seat are constructed of separate planks of durable FSC certified hardwood – four for the tabletops and three for the benches – that fit together or break down for easy storage. The trapezoidal trestles are tubular steel available in matte white or matte black powder coated versions, or in brushed stainless steel. 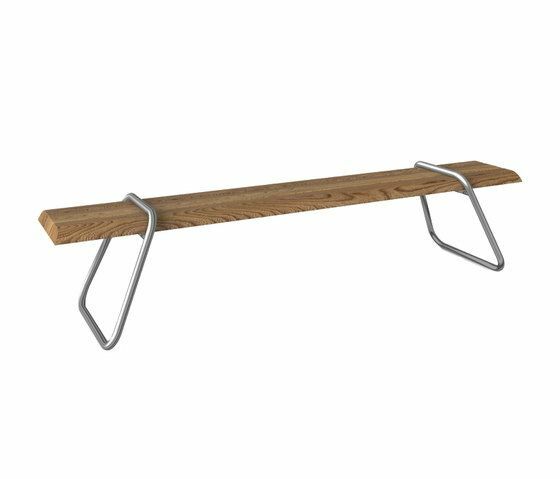 Trestle tables have been around pretty much since the invention of tables, but never quite like the Clip-Board: because the planks fit through narrow openings at the top of the trestles, they act like levers that exert forces against the trestles to form a solid, self-supporting structure. In each version – Clip-board Table, Clip-board Bench, or the Picnic combination picnic table and bench – the total length is 220 centimeters – long enough to comfortably accommodate 4 on each side. Clip-board designer Patrick Kusters is a hands-on designer who sketches, saws, bends, shapes, and welds in his own workplace until he achieves his ideal of clean lines, archetypal shapes, and deceptive simplicity. “With my designs,” he says, “I try to surprise, inspire, and encourage frequent use. Nothing more, but then again, nothing less.” The Clip-board series is a logical extension of the clean elegant lines that characterize the chairs and tables throughout Lonc’s product line, and can be easily combined with Lonc’s Easer or Easer Wood chairs, or its Beaser stools. Based in The Hague in the Netherlands, Lonc has created a signature style that combines simple lines and curves with subtle movement. The elegance of the Lonc design ethic belies the sophistication of its approach to comfort and functionality. Lonc’s creations are unique, organic, modern, timeless, and durable, reflecting the values that have long distinguished Dutch design.